Itanagar MLA Techi Kaso today appeal the people of state to discard fine system and 10 % money lending system prevailing in the society which is creating rift, disharmony and disunity in the society. Kaso was addressing the valedictory function of three days 7th Healing crusade programme-2018 at Christian prayer centre here today amid huge gathering and host of Christian leaders. Kaso said that the fine system and 10 % money lending system is ruining by the individuals in the society which is unexpected and unfortunate. This system need to be routed out from the society as it is creating rift between, disunity and disharmony among the family and in the society. It is a very bad precedence being opted by we tribal community and, it would be eliminated. He said all religion give us a message to live in peace, harmony, prosperity and development for the believers and universe. There have been seen change in habits and attitude with our tribal brothers after the arrival of Christianity and preaching in state. Former Itanagar Municipal Council Deputy Chief Councillor Tarh Nachung in his address said that religion gives us lesson and preaching to stay united and maintaining of communal harmony with peace and prosperity which we need to learn from the bible. The people should be god fearing and believers should also act upon and spread the good message for development and welfare of the people. Speaker, Rev. Pastor Shajet. C. Thomas while elaborated several version and points of bible for the welfare of people, society and mankind with a mindset for welfare of humanity. 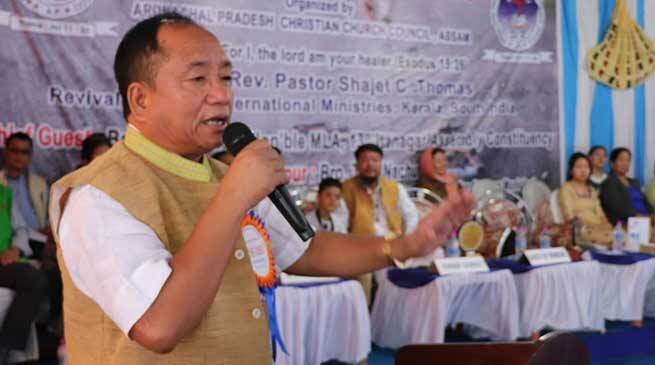 APCCC(A) President Bengia Ridik while lauded the supports of well wisher and believers for the grand success of the three day crusade where in more than 500 believers, church leaders from Assam and Arunachal take part. He inform that the church was founded for all denomination and people come for prayer for last 18 years to get relieved from all troubles. There are 28 churches spread in Assam and Arunachal attached with APCCC(A) and all are doing well and working for the word of god for welfare of the believers and well wishers. APCCC(A) Advisor and Organising Chairman Tadar Takap, APCCC(A) Convenor and Organising Secretary Bengia Logu also address the gathering. Takam Yama and Takam Sara wife of MLA Takam Pario, Maya Dolo wife of former DCM, Pastor Jumi Koyu of Likabali, Pioneer and Rev. Bengia Bina (Yari), several pastors, evangelist, Rev, church leaders from across the state and various parts of Assam attended the function which began on October 26 last.